Detail of the Guanajuato mummies, Mexico. Black and white version. Photo taken at Museo de las Momias de Guanajuato. English : Detail of the Guanajuato mummies, Mexico. Black and white version. Photo taken at Museo de las Momias de Guanajuato. English : A juvenile tentacled snake attacking a fish (a fathead minnow). Taractrocera ceramas, commonly known as the Tamil Grass Dart, is a butterfly belonging to the family Hesperiidae. Taken at Kadavoor, Kerala, India. English : Taractrocera ceramas, commonly known as the Tamil Grass Dart, is a butterfly belonging to the family Hesperiidae. Taken at Kadavoor, Kerala, India. Electric locomotive Škoda ChS4-072 in Vinnitsa railway station. This locomotive has been made in February 1968. The Moscow — Odessa train. English : Electric locomotive Škoda ChS4-072 in Vinnitsa railway station. This locomotive has been made in February 1968. The Moscow — Odessa train. English : X-ray video of a female American alligator breathing. English : Animation of the predicted Andromeda–Milky Way galaxy collision. The Triangulum Galaxy is also shown. Fully grown Atlas moth (Attacus atlas, female) from London Zoo. English : Fully grown Atlas moth (Attacus atlas, female) from London Zoo. English : A raspy cricket fabricating silk. A single crystal of Andradite. English : A single crystal of Andradite. English : A pair of chimpanzees sharing a papaya fruit. The Monkey Puzzle, Rathinda amor (Fabricius) 1775 is a small lycaenid or blue butterfly found in south Asia. English : The Monkey Puzzle, Rathinda amor (Fabricius) 1775 is a small lycaenid or blue butterfly found in south Asia. Fort de Giromagny, Franche-Comté, France. English : Fort de Giromagny, Franche-Comté, France. English : A giggling call of a spotted hyena (Crocuta crocuta), also known as laughing hyena. English : Emperor penguins form large huddles to keep each other warm. This video shows the traveling waves caused by their coordinated movements that result in well-distributed access to the warmest spots in the middle. Golden Eagle in the Wisentgehege Springe game park near Springe, Hanover, Germany. English : Golden Eagle in the Wisentgehege Springe game park near Springe, Hanover, Germany. Frédéric-Auguste Bartholdi, Arrival of Swiss emissaries during the Siege of Strasbourg, bas-relief, 1895. English : Frédéric-Auguste Bartholdi, Arrival of Swiss emissaries during the Siege of Strasbourg, bas-relief, 1895. English : A pelagic thresher shark and a giant manta ray interacting in the presence of cleaner fish. 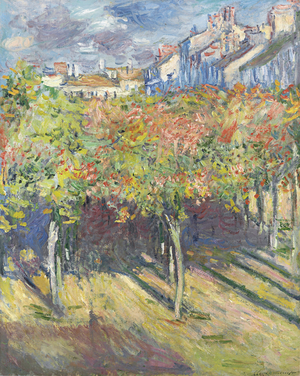 The Lindens of Poissy, by Claude Monet (1882). English : The Lindens of Poissy, by Claude Monet (1882). English : Trypeta artemisiae is a European species of tephritid, or fruit flies in the family Tephritidae. Females oviposit on leafs of Tansy. The Dark-branded Bushbrown, Mycalesis mineus, is a species of satyrine butterfly found in Asia. Taken at Kadavoor, Kerala, India. English : The Dark-branded Bushbrown, Mycalesis mineus, is a species of satyrine butterfly found in Asia. Taken at Kadavoor, Kerala, India. English : A parasitized moth caterpillar, bent over the parasitoid wasp pupae that have egressed from it, defends itself and the parasitoid pupae against a stink bug with violent head-swings, resulting in the predator being knocked off the twig. Brooklyn Bridge with Freedom Tower and 8 Spruce Street in the background at dusk, New York, United States. English : Brooklyn Bridge with Freedom Tower and 8 Spruce Street in the background at dusk, New York, United States. English : The Acorn worm Meioglossus psammophilus. Pigmy Dartlet (Agriocnemis pygmaea) male, a very small (less than 20mm long, 1-2mm thick) apple green damselfly with black thoracic stripes orange colored terminal abdominal segments. English : Pigmy Dartlet (Agriocnemis pygmaea) male, a very small (less than 20mm long, 1-2mm thick) apple green damselfly with black thoracic stripes orange colored terminal abdominal segments. English : "Singing" sounds of an iceberg. Peter and Paul Fortress in Saint Petersburg, Russia. English : Peter and Paul Fortress in Saint Petersburg, Russia. English : Jan Satyagraha 2012 meeting at Agra, Uttar Pradesh, India. English : Calling song of the 17-year periodic cicada Magicicada septendecula. Sculptures of St. Isidoro and Juan Luis Vives at the National Library of Spain, in Madrid. English : Sculptures of St. Isidoro and Juan Luis Vives at the National Library of Spain, in Madrid. English : A nasal rumbling sound of an African bush elephant, visualized with an acoustic camera. Interior wall and ceiling of the Tiles of Sheikh Lotf Allah Mosque in Isfahan. English : Interior wall and ceiling of the Tiles of Sheikh Lotf Allah Mosque in Isfahan. English : Italian wall lizard (Podarcis siculus) hunting in its natural habitat at San Vincenzo, Tuskany, Italy. Papilio clytia form clytia, underside (mimics the Common Indian Crow, Euploea core). The Common Mime, Papilio clytia, is a Swallowtail butterfly found in South and South-east Asia. English : Papilio clytia form clytia, underside (mimics the Common Indian Crow, Euploea core). The Common Mime, Papilio clytia, is a Swallowtail butterfly found in South and South-east Asia. English : A larva of the moth Manduca sexta on the wild tobacco plant Nicotiana attenuata, reacting to experimental stimulation. Center of the large flowering head of a Sunflower (Helianthus annuus), where a ring of mature flowers surrounds the developing floral buds. English : Center of the large flowering head of a Sunflower (Helianthus annuus), where a ring of mature flowers surrounds the developing floral buds. English : Street scenes, regrading work, etc., Seattle, Washington, c. 1930. English : Five burrowing Owls (Athene cunicularia). English : A Common Kingfisher (Alcedo atthis) eating fish in England. male Lattice Brown (Kirinia roxelana), taken in Nahal Kelah, Mount Carmel, Israel, June 8, 2011. English : male Lattice Brown (Kirinia roxelana), taken in Nahal Kelah, Mount Carmel, Israel, June 8, 2011. Cottontop Tamarin in the Tierpark Bad Pyrmont in Bad Pyrmont, Lower Saxony, Germany. English : Cottontop Tamarin in the Tierpark Bad Pyrmont in Bad Pyrmont, Lower Saxony, Germany. English : Territorial call of a male toad, Atelopus franciscus. English : Rosendal Palace. Djurgården, Stockholm. English : Apollo space suits self-support in lunar gravity. During this scene from Apollo 16, Astronaut Charles Duke drops a hammer on the lunar surface, then jumps repeatedly in order to overcome the self-support of the space suit by compressing the space suit knee joint(s) so that he might retrieve the hammer from the surface. The Common Palmfly, Elymnias hypermnestra, is a species of satyrid butterfly found in south Asia. English : The Common Palmfly, Elymnias hypermnestra, is a species of satyrid butterfly found in south Asia. View of the old part of Vyborg, Russia. English : View of the old part of Vyborg, Russia. English : Cacao beans being ground along with cinnamon, almonds and sugar, to make chocolate. Location: Mayordomo store in Oaxaca de Juarez, Oaxaca, Mexico. English : Crematorium at Auschwitz I.